There is a reason why many people like me have lost interest in commenting on Nigerian politics. What seems abnormal to me is really the new normal. Nigeria is what it is and there is this sense that I am crying louder than the bereaved. Our dysfunction is now deeply dyed into our cultural fabric. People have basically decoupled themselves from nationhood and community and are now looking out for themselves. It is so blatant. When I speak with people at home, no matter how you steer them into politics, they don’t seem interested. They seem focused on the self – by all means necessary. They just want to “hammer.” It is what it is. Why are we like this? Why are things the way they are? There is really no shame, no sense of self-reflection, words trump deeds and style is the all important victor over substance. There is no leadership, to be honest, and I am not just talking about political leadership. We are all the same in the communal hypocrisy and greed. I think about how public intellectuals are struggling to normalize, Sanusi Lamido Sanusi, SLS, the Emir of Kano, Mr. Glib, Mr. Do what I say, a note what I do, and I remember, they normalized Buhari, they normalized Amaechi, they normalized El-Rufai, they normalized Obasanjo. Their job as intellectuals is to make you forget. #AnimalFarm. If you are a thief and a thug and you are generous to them, you can murder hundreds, you can steal billions, you can be incompetent and you will be fine. You will not be a distressed character in their insincere books and essays. You must not separate the messenger from the message; when you do you decouple them from their sins. These people have ruined our country. How can we soon forget SLS’s misdeeds? No, he is a charming soul, he says all the right things, and if he likes you, he will be your Robin Hood. He loves public intellectuals. This is my larger point: There is no hope for Nigeria. I do not see any progress through my generation or the generation coming after. 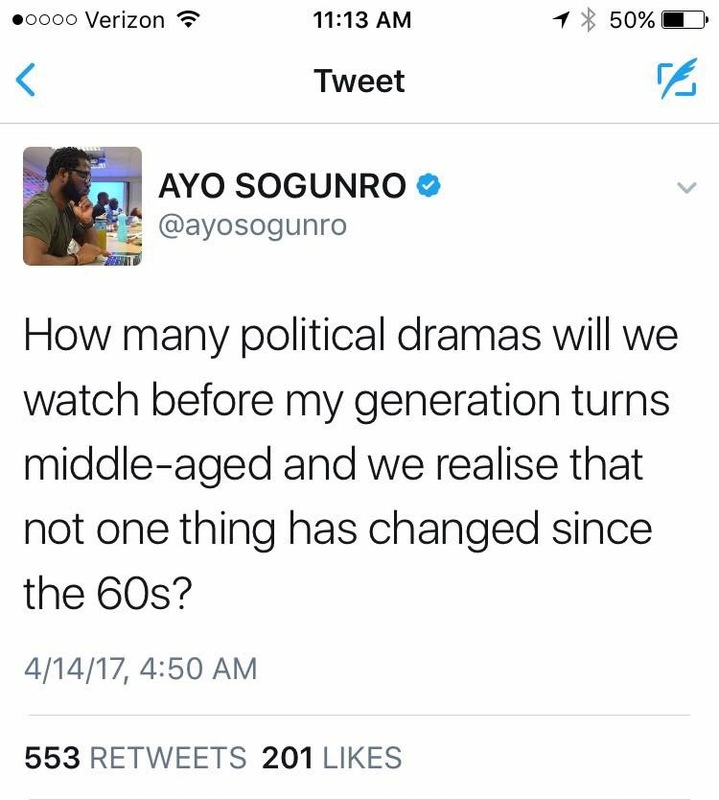 Indeed the generation coming after promises to be much worse judging by their antics on social media. They are training you to be unthinking dolts. Do not ask questions, they say, this is church! There is no hope. If you doubt me, do a survey of where our leaders and their families go to for education, health, vacations, good living. Not in Nigeria. Buhari’s dying veins are hooked to the laboratory machines of the secret agencies of the West. Imagine that, after billions of Naira budgeted for a medical clinic our president had to go abroad to the West to attend to his health. The CIA knows everything about his blood cells. We don’t. Go figure. Nigeria is not a country. Next Post Dear African writer in the Diaspora: What is your mission?